In addition to being Red Cross Month, when the American Red Cross promotes its services and raises funds, March is the month when the cause of tuberculosis was discovered and the first polio vaccine developed. Organized by Clara Barton in 1881, the American Red Cross was largely dependent on individual donations in its early days. But that changed in 1917 with America’s entry into World War I. In June of that year, President Woodrow Wilson ordered the Red Cross to raise funds to aid the military. In just a few short days, more than $115 million came in, well beyond the $100 million goal the Red Cross had set for its first-ever War Fund drive. In 1943, in the midst of World War II, President Franklin Roosevelt, officially declared March as “Red Cross Month” and almost $146 million poured in. Since then, March has been the month for the Red Cross. As a poignant footnote, the last radio speech President Roosevelt gave, just days before his death, was in support of the 1945 Red Cross campaign. 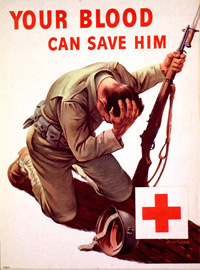 Caption: The undated poster, calling for blood donations for military personnel during WWII, shows a soldier on his knees, grasping the crown of his head with one hand and holding his rifle in the other. His helmet has a bullet hole in it and is lying on the ground. The Red Cross logo appears bottom right. 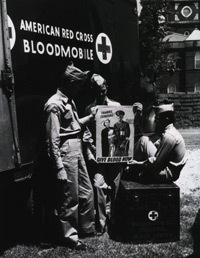 Caption: Three enlisted men of the Signal Corps Radio Receiving Station pose next to an American Red Cross Bloodmobile in La Plata, Maryland, in this promotional poster from July 24, 1953. Robert Koch, a German physician and scientist, is credited with discovering and isolating Mycobacterium tuberculosis, the bacterium that causes TB. He presented his findings before the Physiological Society of Berlin on March 24, 1882, and, in 1905, was awarded the Nobel Prize in Physiology or Medicine for his discovery. Caption: An advertising image showing Koch in India, where he studied cholera and TB. The first polio vaccine, known as inactivated poliovirus vaccine (IPV) or Salk vaccine, was developed March 26, 1952 by American physician Jonas Salk at the University of Pittsburgh. Using a “killed” virus, it was given by injection. Massive clinical testing began in 1954 in the United States and Canada. The incidence of polio in the US rapidly fell from 18 cases per 100,000 people to fewer than 2 per 100,000. Wide scale vaccination of children began in 1955. In countries where Salk’s vaccine has remained in use, the disease has been practically eradicated.